Canon 5D line to be split? 5DX and 5D Mark III coming soon? Could the 5D be about to upgraded with not one, but two new models? New rumours are suggesting that the upcoming replacement for the EOS 5D Mark II will be split into two lines, with one featuring a 45 million pixel sensor. It's another day, and so another Canon 5D Mark III rumour emerges. Disappointed from the lack of an upgrade at last week's CP+ show in Japan, the rumour mill is now suggesting that it will in fact be split into two cameras. 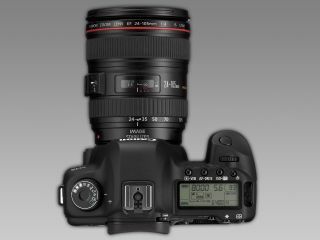 We've been waiting for a new 5D, ever since, well the 5D Mark II was unveiled. Canon's biggest rival, Nikon, unveiled the Nikon D800 last week which would be the most obvious competitor to any 5D upgrade. The D800 features a 36 million pixel sensor, while most rumours up until now have suggested that a 5D Mark III (or 5DX) would only be around 22 million pixels. Now there are suggestions that the line will be split in two with one variant featuring a whopping, Nikon-beating, 45 million pixel sensor. It has also been said that the pixel size would be similar to that of the Canon G1 X, the company's recently announced premium compact. Other suspected 5D X specs include a 61 point AF, 3.4fps shooting, ISO 100-6400 (expandable to 50-12800) and both a Digic 5 processor and Digic 4 processor (as seen on the 1DX). Meanwhile, the 5D Mark III is believed to have a 22 million pixel sensor, 61 autofocus points, 6.9 fps shooting and ISO expandable up to 51,200. It seems likely from those specs that the 5D X would be aimed at studio and portrait photographers who are looking for the huge megapixel count, but aren't so bothered about fast shooting. In other words, the same people that would be looking to buy the new Nikon D800. Only time will tell if either, or both, of these rumours turn out to be true, but one of the latest rumours suggests that a new DSLR will be unveiled at the end of the month. Canon announced it was working on a new full-frame camera back when it announced the 1DX. With Canon appearing at Focus this March after last year's no-show, perhaps we will have something to look forward to.